The exceptional strength of our reinforced adhesive tape makes it ideal for applications that need heavy duty or high security sealing. The cross weave tape is made from high-quality glass fibre material which is impossible to tear along its width or length – it can only be cut with a dispenser, or a very sharp pair of scissors or knife. Due to its high strength and superb adhesion, our reinforced security tape is the perfect solution for export packaging. It is also great for banding, reinforcing and bundling heavy consignments and containers. You can even use it to strap two or more cardboard boxes together. To say that our two-way reinforced tape is strong is an understatement. This outstanding adhesive packing tape is woven through, both horizontally and vertically, with glass fibre filaments to resist tearing, splitting or ripping. It is the answer to all your high security and heavy duty sealing needs. As well as being extremely strong and durable, our reinforcement tape easily sticks to a wide range of surfaces including plastic, board and paper and is suitable for binding together metal poles and frames or securing palletised loads. Use our cross weave tape to secure your cartons and other containers for export or to bundle items together. It’s especially useful as an adhesive packing tape when exporting goods because it has high resistance to temperature changes and humidity. Our reinforced tape is perfect for the heavy duty sealing and securing of packages in transit. 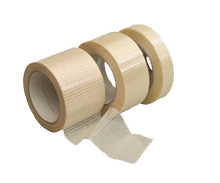 The reinforced tape comes in packs of six 50m rolls and is available in three widths: 25mm, 50mm and 75mm.